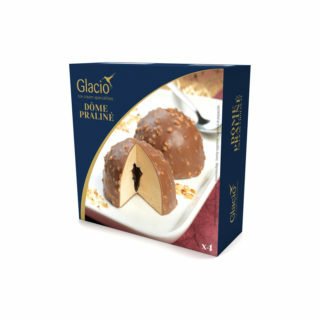 This unique creation is a fusion of Belgian praline chocolate and ice cream. Three refined flavours in one package. 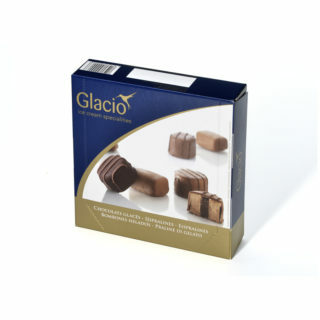 3 pralines with flavours like Marc de Champagne, Truffle-Liqueur and Amarena. Declaration Title: A selection of different ice cream pralines: 3 x vanilla ice cream with a filling of white chocolate, cream and alcohol, covered with white chocolate and chocolate couverture stripes. 3 x chocolate ice cream with chocolate filling with cointreau taste, covered with milk chocolate and white chocolate stripes. 3 x almond ice cream with amarena cherry cocktail, covered with milk chocolate and chocolate couverture stripes. Ingredients: skimmed milk, sugar, cocoa butter, water, whole milk powder, vegetable fat: coconut, lactose and milk protein, glucose syrup, cocoa mass, butterfat (contains milk), cream (contains milk), fat-reduced cocoa powder, emulsifiers: mono- and diglycerides of fatty acids, lecithins (soya); marc de champagne, almond paste, flavourings, cointreau, sour cherry juice, concentrated whey product (contains milk), stabilizers: locust bean gum, guar gum; alcohol, almonds, lemon juice concentrate, colouring food: beetroot concentrate, acidifier: citric acid; colouring: carotenoids, inverted sugar, bitter almonds.